Contrary to the gym mythology, true strength training is not about your muscles but about your mind. Anyone with a serious injury knows that rebuilding muscle strength can be difficult. Now researchers at the Ohio Musculoskeletal and Neurological Institute (OMNI) at Ohio University have verified what many coaches and athletes have been stating for decades–that the mind is critical in maintaining muscle strength. The article “The power of the mind: the cortex as a critical determinant of muscle strength/weakness” is published in the Journal of Neurophysiology. The research suggests muscles respond to simple thoughts of exercise; simply imagining exercise can trick the muscles into delaying atrophy and even getting stronger. It’s further proof that brain and body, which evolved together, are more intwined than separate. Through it’s connection to the endocrine system (the body’s chemical plant), different thoughts and mental states release hormones that can dramatically accelerate or retard muscle growth. In fact, some people, in search of a way to speed the process, ingest or inject extra amounts of these or similar chemicals. How efficiently that impulse is delivered and how receptive your muscle is to that impulse determines, in large part, how forcefully that muscle can contract. The more fully and the faster it contracts, the stronger we say it is. We call this process neuromuscular facilitation. 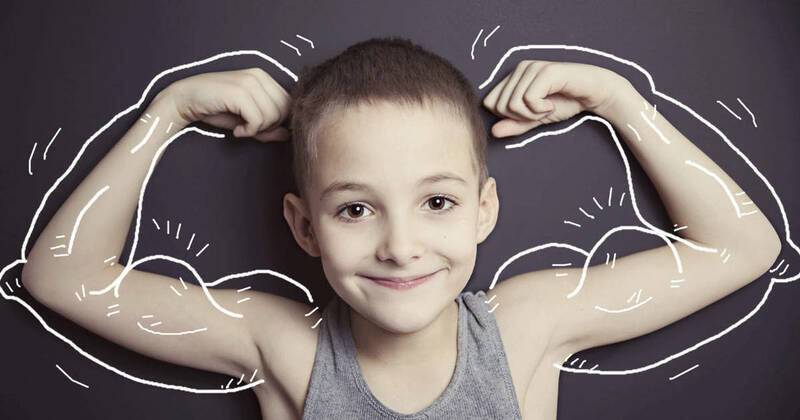 The development of muscle strength in children is related to age, body size, previous levels of physical activity, and various phases of growth. But we know children can enhance their strength levels in terms of adaptation faster than adults. Some experts believe this has to do with the plasticity of the brain. Strength is controlled by a number of factors — the most studied by far is skeletal muscle. However, the nervous system is also an important, though not fully understood, determinant of strength and weakness. Brian C. Clark and colleagues set out to test how the brain’s cortex plays into strength development. They designed an experiment to measure changes in wrist flexor strength in three groups of healthy adults. Twenty-nine subjects wore a rigid cast that extended from just below the elbow past the fingers, effectively immobilizing the hand and wrist, for four weeks. Fifteen subjects who did not wear casts served as the control group. Of the group with wrist-hand immobilization, half (14) were asked to regularly perform an imagery exercise, imagining they were intensely contracting their wrist for five seconds and then resting for five seconds. They were verbally guided through the imagery exercise with the following instructions: “Begin imagining that you are pushing in as hard as you can with your left wrist, push, push, push and stop. (Five-second rest.) Start imagining that you are pushing in again as hard as you can, keep pushing, keep pushing and stop. (Five-second rest. )” This was repeated four times in a row followed by a one-minute break for a total of 13 rounds per session and five sessions per week. The second group performed no imagery exercises. At the end of the four-week experiment, both groups who wore casts had lost strength in their immobilized limbs when compared to the control group. But the group that performed mental imagery exercises lost 50% less strength than the non-imaginative group (24 percent vs. 45 percent, respectively). The nervous system’s ability to fully activate the muscle (called “voluntary activation” or VA) also rebounded more quickly in the imagery group compared to the non-imagery group.